Metronidazole is an antibiotic from the class of drugs known as nitroimidazoles. Generic Metronidazole prevents the DNA synthesis from occurring in the vulnerable anaerobic bacteria and protozoa that attack the human body. In this manner it is able to inhibit the functioning of the invading bacteria as well as prevent their further development. Flagyl, an antibiotic with a wide spectrum, is useful in treating various bodily infections that may occur in the skin, gut areas, gums, brain abscesses, leg ulcers, pressure sores, and pelvic cavity. It is also used to treat septicemia [blood poisoning], necrotizing pneumonia, osteomyelitis [bone infection], peritonitis [abdominal infection], bacterial vaginosis [vaginal infection], urogenital trichomoniasis [an STI], and amoebic dysentery [a protozoal infection]. It's an oral medicine. The dosage depends on the individual medical condition, the nature of infection and it's severity. It is given to children only to treat amoebic dysentery, when the weight of the child is taken into consideration. Take the dose exactly as prescribed. The medicine should not be chewed, but swallowed with a glassful of water. It can be taken with or without meals. Try to take the medicine at regular intervals. 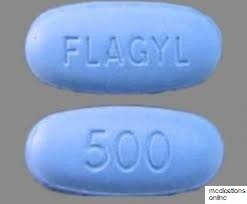 Do not administer Flagyl if you are allergic to metronidazole or any other component of the drug, or if you have taken Antabuse (disulfiram) during the last two weeks. To ensure complete safety of the medication intake and guarantee the best results of the treatment course, inform your doctor if you have ever had or suffer from any of the following health conditions: kidney or liver disease, Crohn’s disease or any other intestinal or stomach impairment, any nerve disorder, any fungal infection, blood cell disorder, such low WBC count or lack of red blood cells in the body. 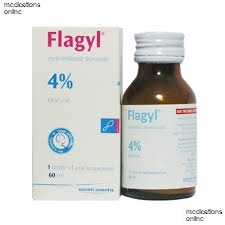 Be careful when using Flagyl during pregnancy or lactation as it may cause harm to an unborn or nursing child. Breastfeeding is forbidden within 24 hours after the last medication intake. Consult your doctor if you miss a dose. If you do miss a dose, then try to take the missed dose as soon as you can, but if time is nearing for the next dose, then leave the missed dose and take the regular one; don't double your dose. Overdose symptoms can include: nausea, vomiting, seizures, or severe dizziness. US residents can call the US national poison hotline at 1-800-222-1222. If the victim collapses or stops breathing, call local emergency services at 911. An allergic reaction such as:- itching, rash, labored breathing, wheezing, or any swelling means that you should stop the medicine and ask your doctor for help. After you buy Flagyl, store it at a room temperature of 25 C, safe from heat,light and dampness. Keep it out of reach of children and pets. In serious conditions, the physician may give it intravenously, to be followed by the oral treatment if considered necessary. As the medication has a sedating effect, those who drive, perform risky tasks, or handle machinery, should refrain from such activities, until they are aware of how the medicine can affect them and are sure of handling its’ effect. Those getting their liver function and blood triglyceride levels checked, should inform the lab personnel that they are taking Flagyl, for the medicine can lead to false results in such cases.